What do you think? 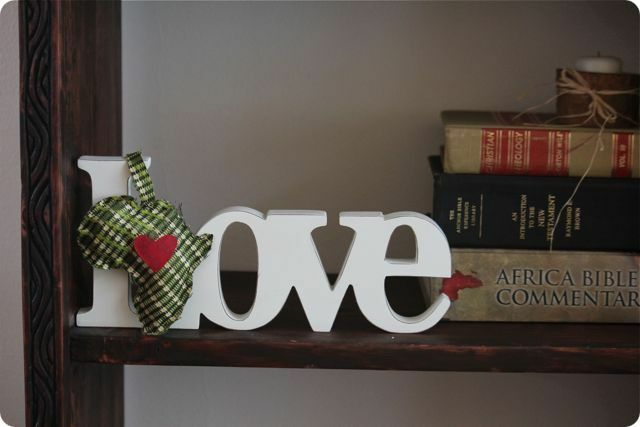 And what about the heart, yes or no? 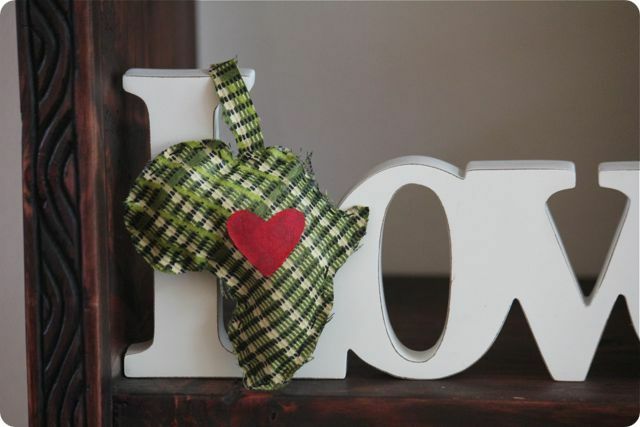 This entry was posted in Africa, Christmas, DIY on October 21, 2011 by Deanna. I have been MIA this week, getting ready for Christmas. A while back I had told you that my mom was going to give me her left over material that was used for her bridesmaids dresses and I was so excited. 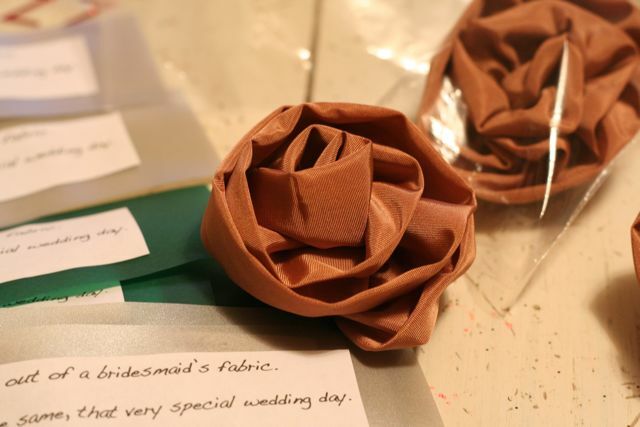 Her colors were rust and cream and I knew the taffeta fabric would be beautiful. 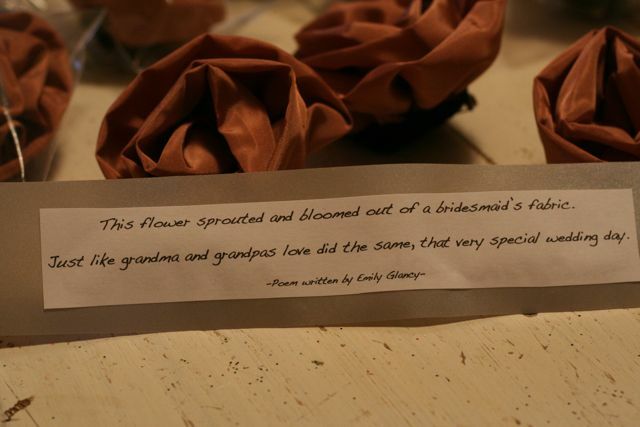 I wanted to make something special for my sisters and all the granddaughters so I made these brooches and my daughter came up with this amazing poem to go along with them. What makes them more special is that this year would have been my parents 50th anniversary and yesterday two years ago is the anniversary of my fathers death so I know the girls will cherish these. This entry was posted in Christmas, Holidays, I made this! on December 24, 2010 by Deanna. I love this idea! 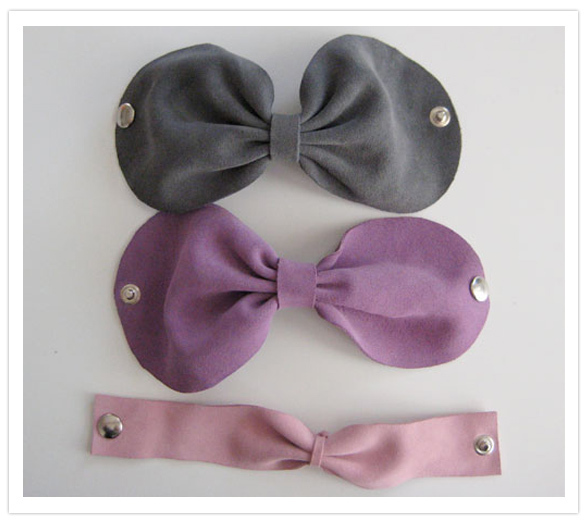 We have had so much fun making our own bows, the color combinations are so fun. 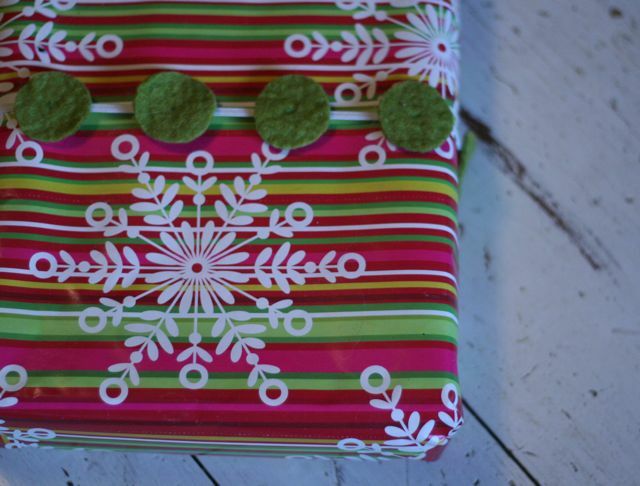 If you are low on funds, and have some old magazines laying around, try this, your gifts will sparkle. 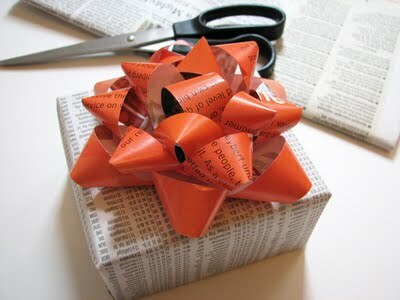 How about Orange has a great tutorial to get you on your way to making your own bows. Click here for the instructions. 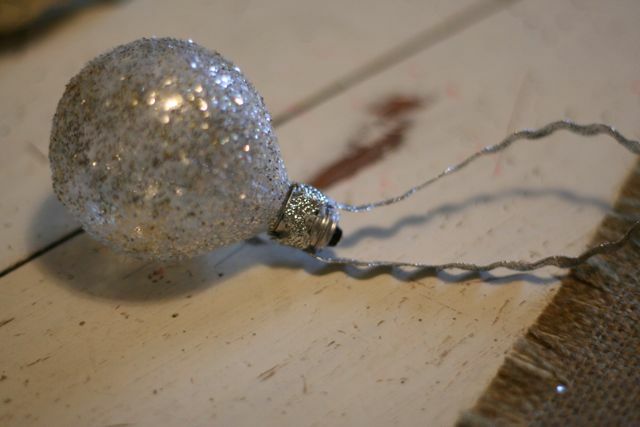 This entry was posted in Check this out!, Christmas, DIY, Holidays, Recycled, tutorial on December 17, 2010 by Deanna. 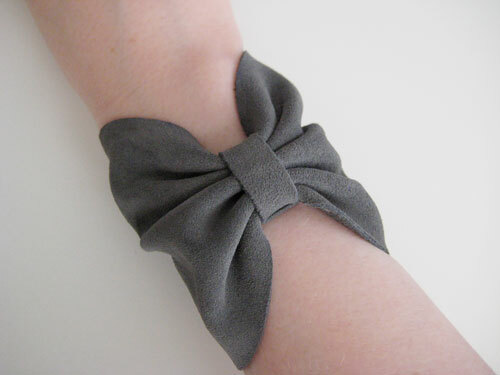 All you need is some elastic, doesn’t matter the width, and some felt circles to make this cute elastic gift band. 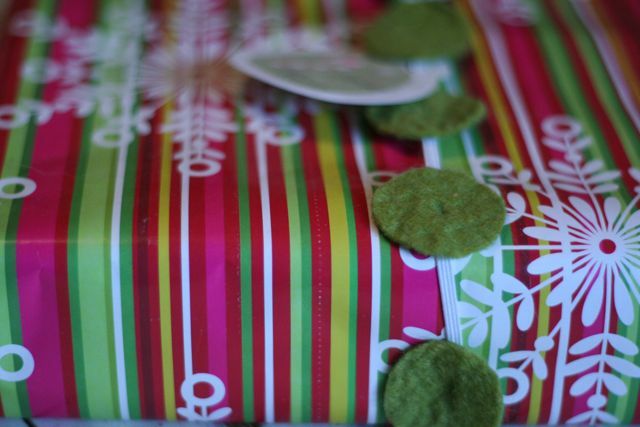 Its been so fun wrapping gifts this year, well I should say watching my daughter wrap gifts. She comes home from school everyday asking what she can wrap. 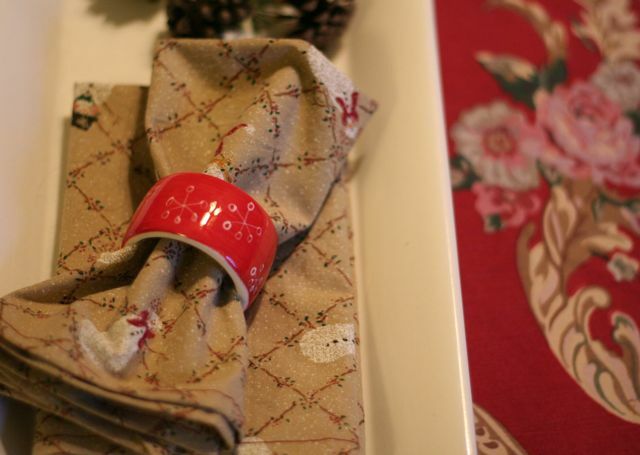 We have tried to stay with recycling and have made a lot of the gift ties and bows(that’s coming tomorrow). 1.Gather up some elastic and felt(cut in circles, size of your choice). 2. Cut the elastic to the size you want, then machine stitch the ends together. 3. 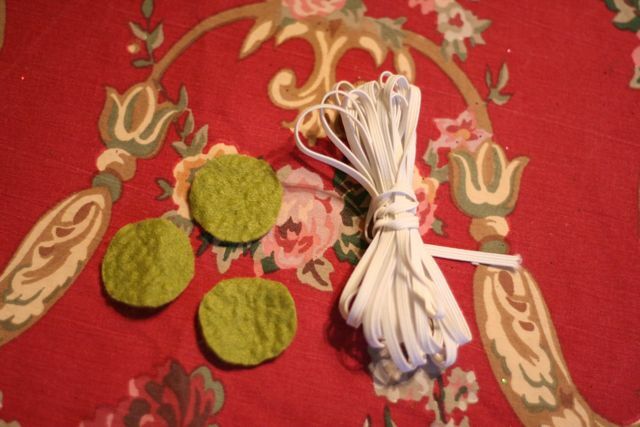 Using a needle and thread, sew on the circles by hand, remember the circles will touch when sewing them on. And that’s it, simple and fun! Sorry I didn’t have any photos of the sewing process but its fairly simple to figure out. 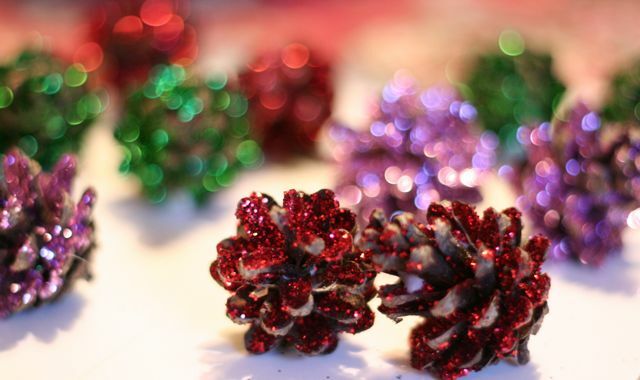 This entry was posted in Christmas, DIY, Holidays, tutorial on December 16, 2010 by Deanna. I love it when my daughter wants to create something with me! She was looking around the kitchen and had found to light bulbs that were getting ready for the recycle bin and asked if we could add some glitter to them and make ornaments. I said yeah why not. 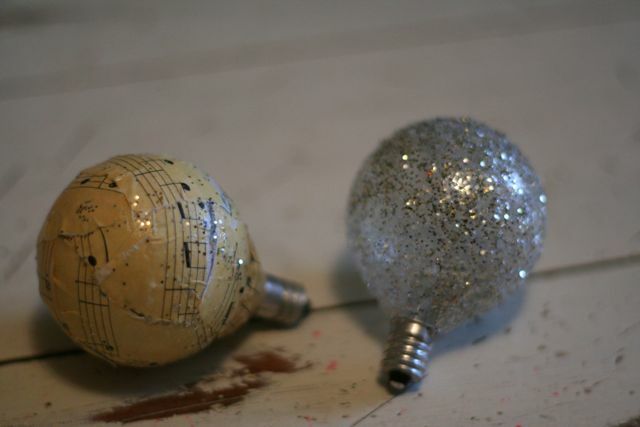 So she got out the trusty Mod Podge(I don’t know what I would do without it) and we each decorated a light bulb. 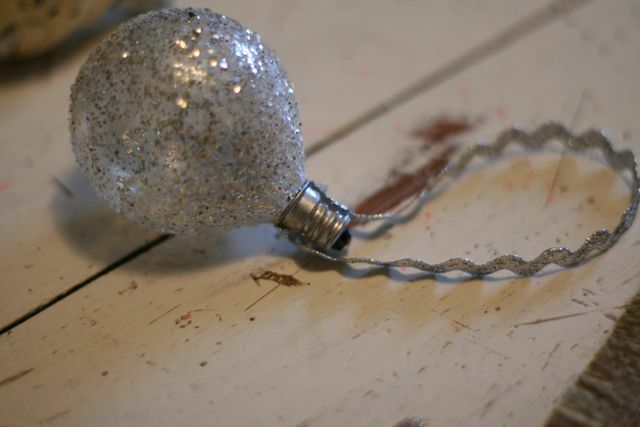 This is pretty easy, all you need is: an old light bulb, Mod Podge(or glue), paint brush, glitter, a ribbon and hot glue gun. 1. 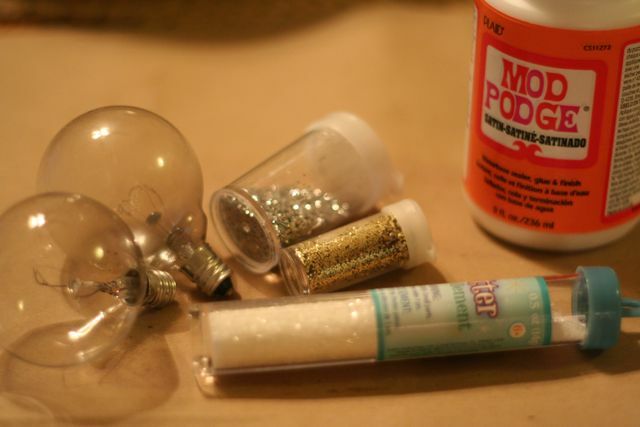 Using your paint brush, paint Mod Podge all over your light bulb, then cover it with glitter. 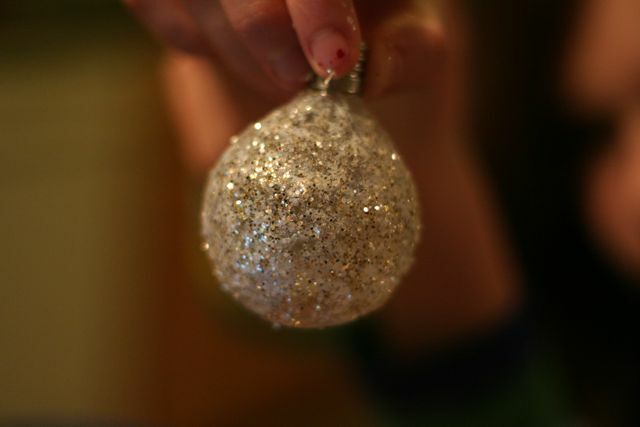 My daughter made a mix of gold, silver & white glitter. 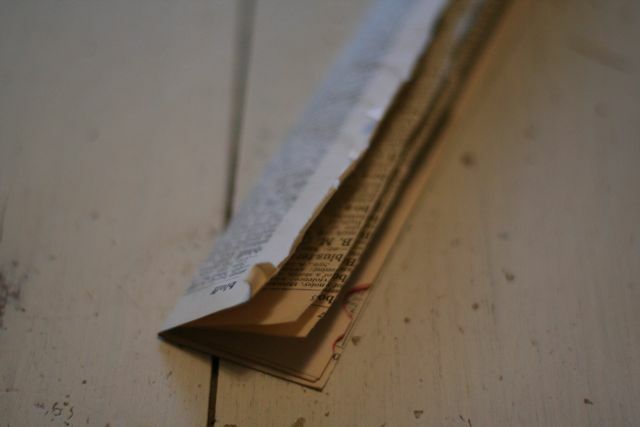 For a different look, I Mod Podged my light bulb and covered it with small strips of sheet music. 2. Cut two strips of ribbon. One small piece to wrap around the base and one large piece for hanging on the tree. 3. Hot glue the large piece of ribbon to each side of the base. 4. Hot glue your small piece of ribbon around the base, covering the ends of the other ribbon. And there you have it, super simple and super cute! 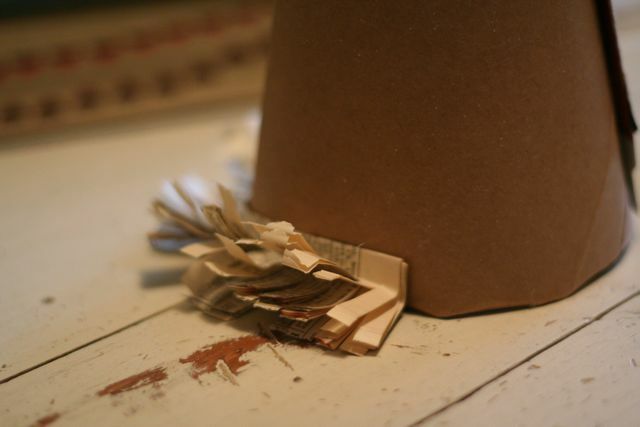 This entry was posted in Christmas, DIY, Holidays, I made this!, Recycled, tutorial on December 14, 2010 by Deanna. 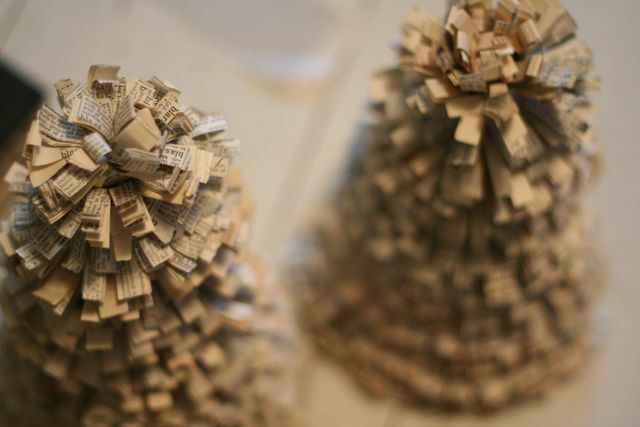 I love it when I can make something that is completely recycled. 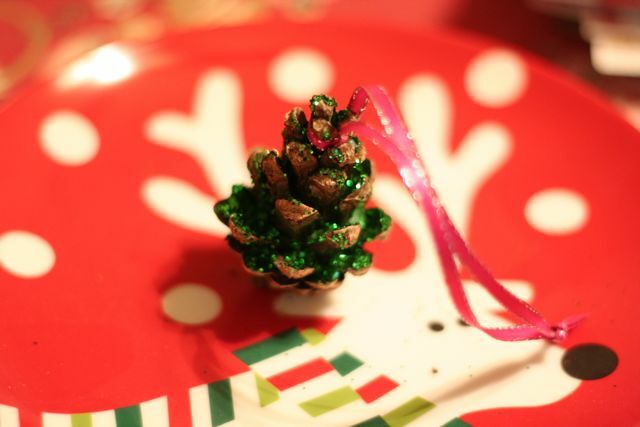 This little tabletop Christmas tree is one of those projects. 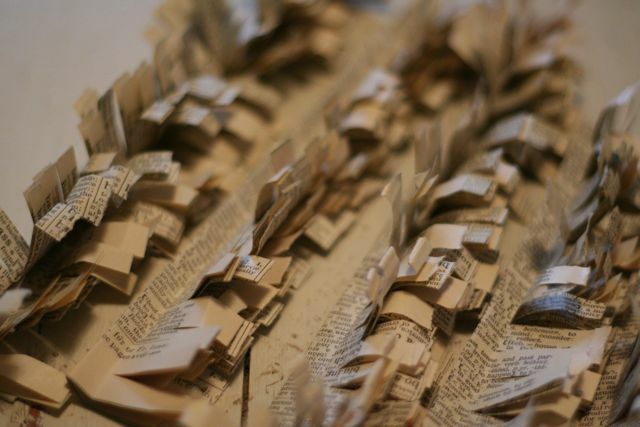 If you have an old book or newspaper laying around that has those lovely yellowed aged pages, this would be the perfect project to use them on. 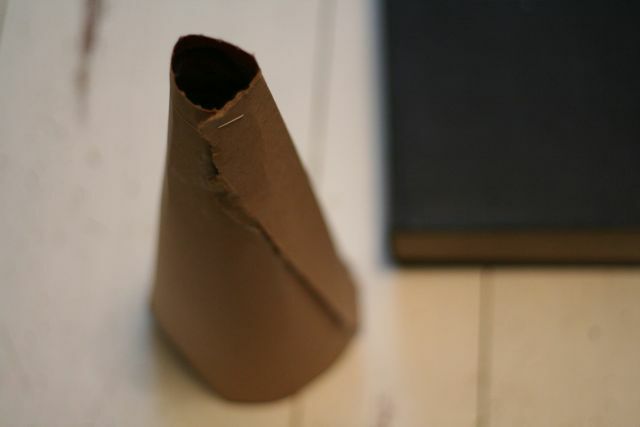 1.Roll your frozen pizza or cereal box into a cone. I glued the edge down and then stapled them at top and bottom to stay. 2. 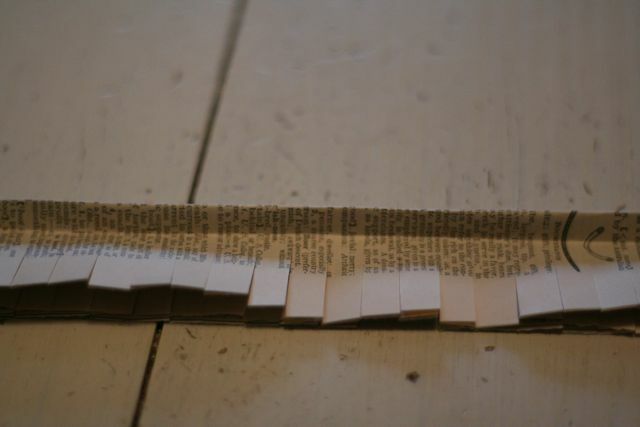 Pull out two pages from a book and fold in half. My pages measured 6X10. 3. 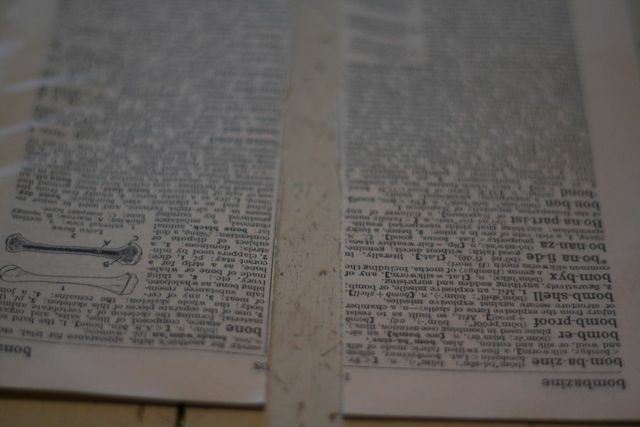 Tear the page in half. 4. Lay the two pieces on top of each other and fold in half. 5. 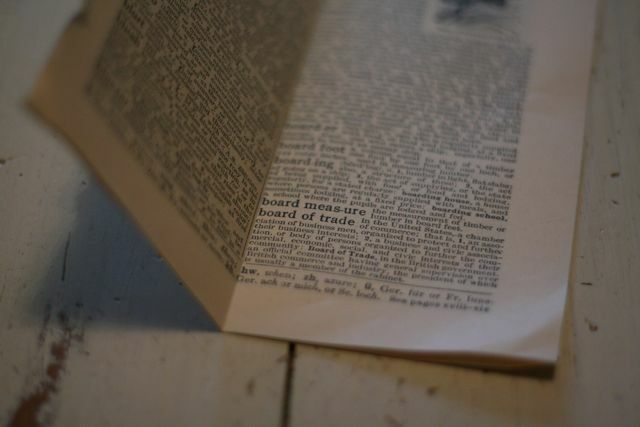 Cut into the open side of the papers, making sure not to go all the way through the paper. Then bend the folded side in about a 1/4. 6. 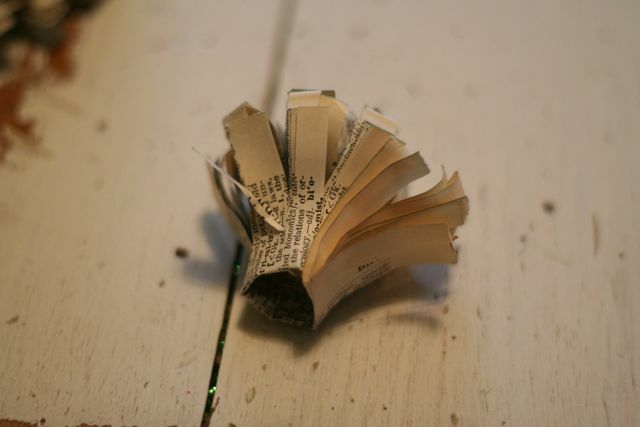 Crumple the ends, scrunching all the way down. I made a whole bunch before I started gluing. 7. 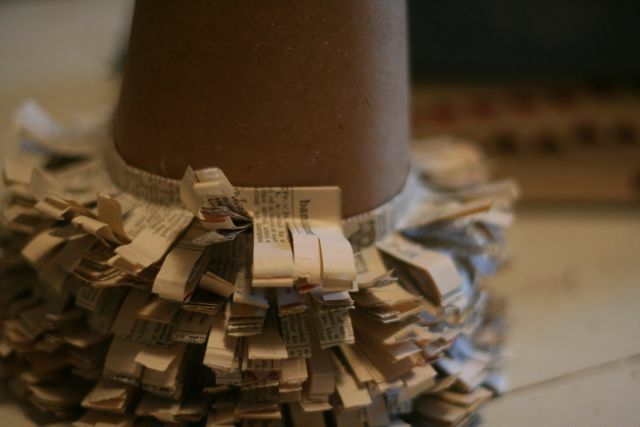 Starting at the bottom, start hot gluing the paper onto the cone. 8. 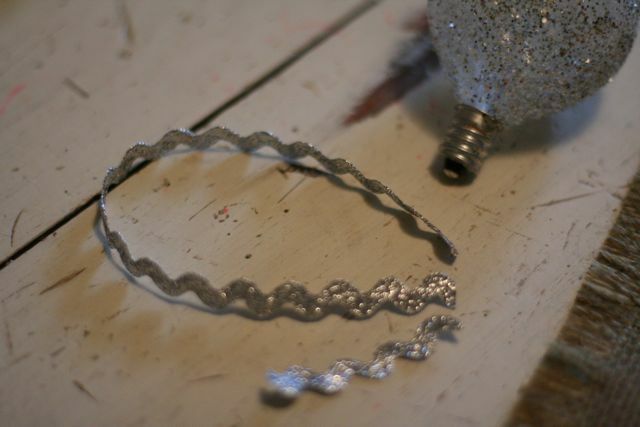 Continue glue pieces all the way, winding as you go. 9. Finish the end at the top, making sure to cover the cone completely. 10. 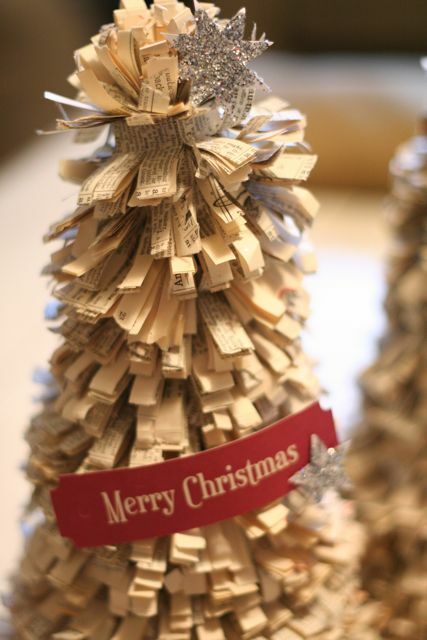 Make the top of the tree by using another strip of cut paper and rolling it into itself. 11. Add glue to the top and insert inside the hole. 12. Decorate and your done! This entry was posted in Check this out!, Christmas, DIY, Holidays, I made this!, Recycled, repurpose, tutorial on December 13, 2010 by Deanna. These were so much fun to make, super easy too and suede when cut with sharp scissors makes a very clean edge. I used a leather shirt and suede coat that I found at the Goodwill for my bracelets. They turned out so pretty and very comfy to wear. I found this over at 100 Layer Cake (the original post came from maikitten), they always have the most interesting wedding and non-wedding ideas. For details on how to make one click here, it is in German but you will get the idea. 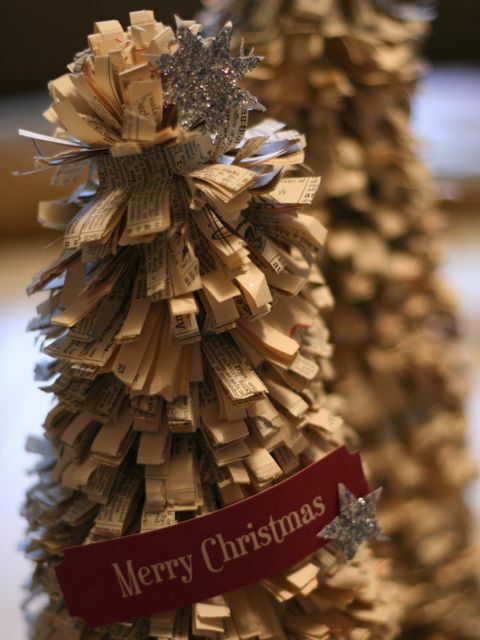 This entry was posted in Christmas, DIY, Gifts, Holidays, Recycled, tutorial on December 9, 2010 by Deanna. Remember that wonderful weekend I got to spend with my sisters and mom? Well part of our time was spent shopping and we got to look at a lot of Christmas decor. 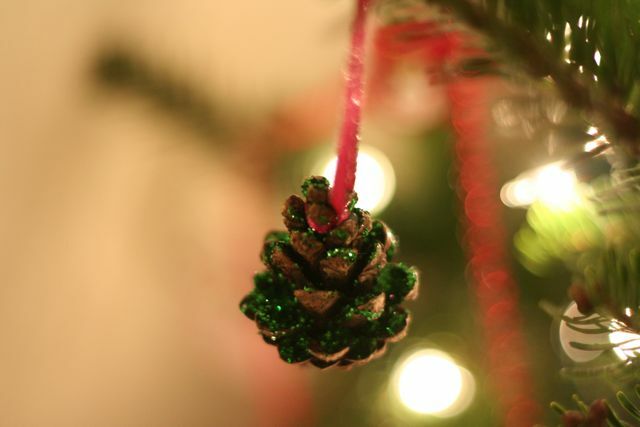 I found these pine cone ornaments that were so cute and yet something that could easily be made. 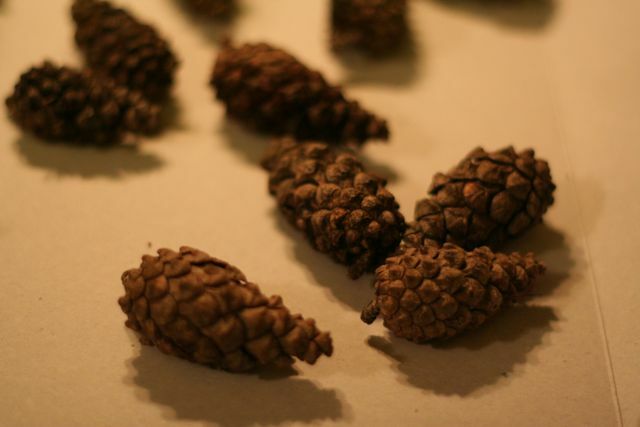 I didn’t have any pine cones in my yard but a friend let me scrounge around her yard for some. Most of them were closed so I had to do some prep work, but even that was easy. 1. 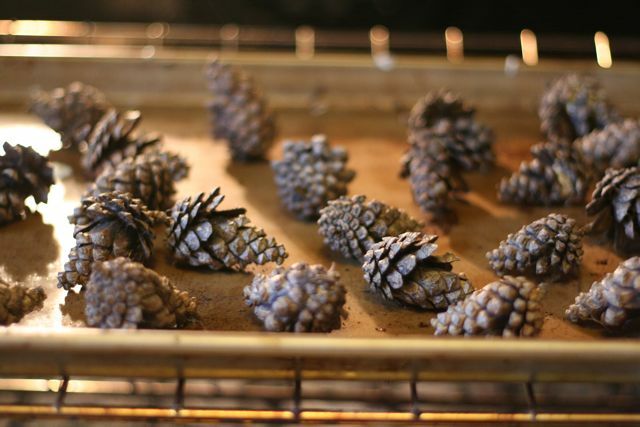 If your pine cones are closed, stick them in the oven at 200 degrees. 2. Keep checking them until they are dry and open up all the way(about 2-3 hrs). 3. 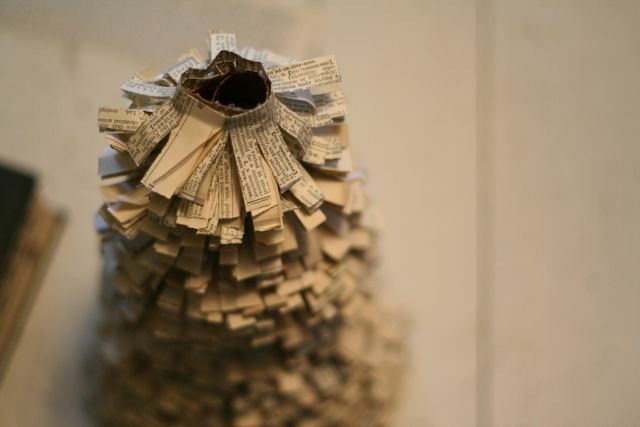 Put Tacky glue on each section of the pine cone. 4. Cover completely with glitter. 5. 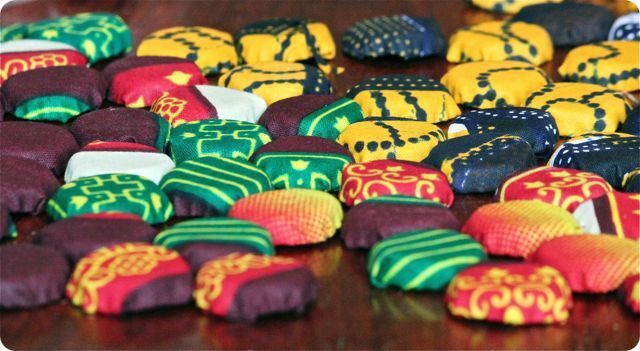 Let them dry completely and add a ribbon. 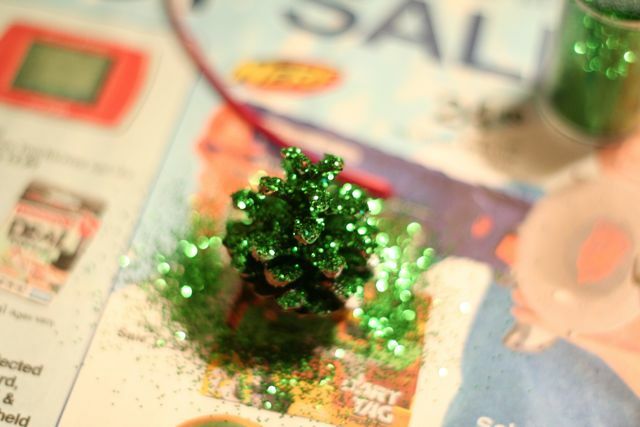 This entry was posted in Christmas, DIY, Holiday, tutorial on December 8, 2010 by Deanna. These are super easy and super fast. I had just enough fabric to make 4 cloth napkins. 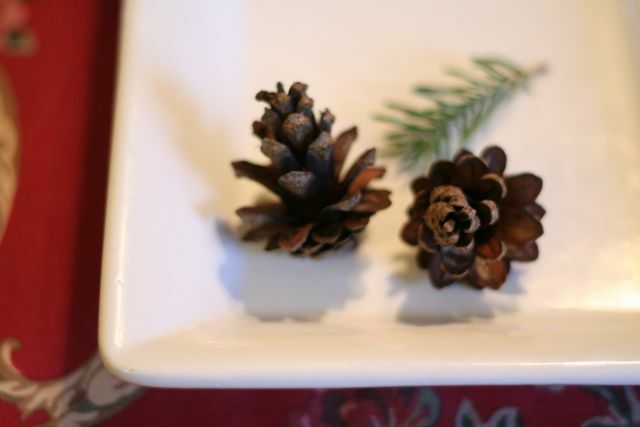 Try making some for a gift or for your own holiday table, you wont be disappointed. Design sponge has an easy tutorial to follow, just click here. 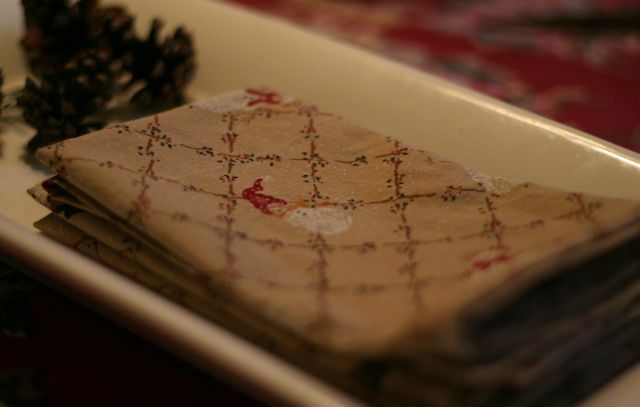 But the best part about these napkins is that they are completely recycled, I found the fabric at the thrift store. 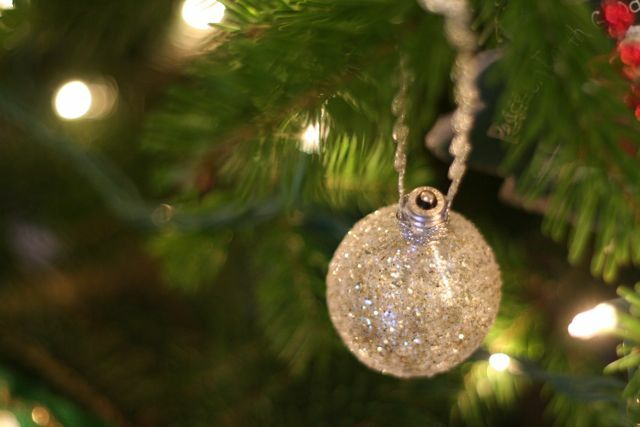 Check back tomorrow for some really pretty ornaments! 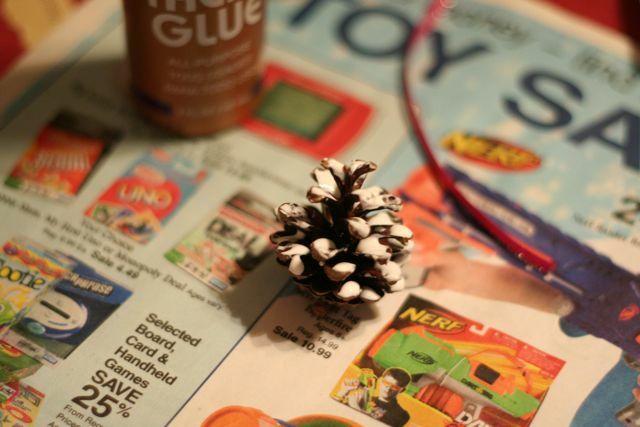 This entry was posted in Christmas, DIY, Holidays on December 7, 2010 by Deanna.